Pingasa rubicunda Warren, 1894, Novit. zool., 1: 385. Diagnosis. This and the next two species are very similar. P. rubimontana Holloway & Sommerer has a reddish brown tone to the marginal grey area of the wings, and reduced yellow at their bases on the underside. In P. tapungkanana Strand this marginal zone is somewhat bluer. Many specimens of rubicunda have a brownish suffusion in the basal half of the hindwing, particularly in association with the scale brushes. The forewing antemedial is more regularly dentate in rubicunda and rubimontana than in tapungkanana. The male genitalia are diagnostic. Taxonomic notes. 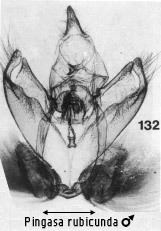 The record of this species by Holloway (1976) refers to the next species. Geographical range. N. India, Sundaland, Philippines. Habitat preference. This species is frequent in lowland forests, particularly those with some degree of disturbance. It also occurs infrequently in lowland plantations (Chey, 1994), and rarely in lower montane forest. Biology. Forest Research Institute of Malaysia records note this species as feeding on Shorea (Dipterocarpaceae) flowers as a larva.